In the 60th anniversary year of the New York Convention and following the events held across a number of offices marking the occasion, Paula Hodges QC, and Hannah Ambrose and Vanessa Naish look at whether the New York Convention is a triumph of transnational legal co-operation, or needs revision; Alastair Henderson and Gitta Satryani present the results of a survey on enforcement in ASEAN; and Dr Jörg Weber of UNCTAD discusses the impact of the Convention on FDI. Recently promoted partners Amal Bouchenaki and Helen Tang feature in a spotlight article providing insight into their achievements and interests. Regional trends in South East Asia and efforts to adopt best practice in Malaysia, Thailand and Vietnam are analysed by Alastair Henderson, Daniel Waldek and Reshma Nair. The new Managing Partner of all our Greater China offices, May Tai, is featured in a spotlight interview. The rise of resource nationalism in Africa, its implications for clients and potential for recourse via investment arbitration is explored by Peter Leon, Andrew Cannon and Iain Maxwell. Mike McClure provides insight into another market in the Asia Pacific region in ‘A View from Seoul’, considering how international arbitration is viewed in Korea and how that view is shifting rapidly. Catrice Gayer summarises the key changes to the DIS (the German Institute of Arbitration) Rules for anyone considering a DIS arbitration clause or anticipating a DIS arbitration in the near future. This issue’s sector-focused piece by Murphy Mok, Daniel Waldek and Scott Ivey looks at building Infrastructure in Asia Pacific and issues and trends for construction disputes across the region. Previous editions can be viewed on our website by clicking on this link. 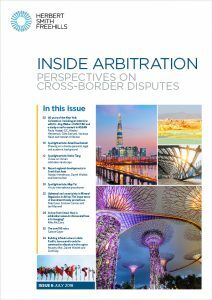 We hope that you enjoy reading issue #6 of Inside Arbitration and would welcome your feedback.